A recent TED Talk makes a strong case for the healthcare industry to adopt augmented reality as a means to expanding access to surgical care across the globe. During her presentation held in New Orleans in Nov. 2017, Nadine Hachach-Haram, surgeon and co-founder of Proximie, a company that builds augmented reality tools for use in the operating room, consulted in a live surgery taking place in Minnesota using a web camera and a laptop running her company's remote AR platform. Warning: There are graphic surgical images below that may spoil your appetite. Capturing a live feed with an overhead camera, surgical scope, or other device with a video output, Proximie transmits the surgeon's view of the operation to remote experts, who can annotate the surgeon's view right through the software on a computer or mobile device. Moreover, with a web camera, remote users can film hand gestures and superimpose them onto the surgeon's view of the operation. The surgeon can see the annotations and hand movements, hear audio, and even read direct messages on his or her screen in real time while operating. And this could be scaled beyond computers, smartphones, and tablets, to work smoothly on the HoloLens, ODG smartglasses, or even Google Glass, which is still being used by some medical professionals. We are so used to using digital technology to communicate through voice and text and video. But augmented reality can do something so much deeper. It allows two people to virtually interact in a way that mimics how they would collaborate in person. Being able to show someone what you want to do, to illustrate and demonstrate and gesture, is so much more powerful than just telling them. And it can make for such a great learning tool because we learn better from direct experience. Proximie's platform is not only good for use in surgical procedures for extra guidance from colleagues, it can help train students in medical school by bringing in remote surgeons to provide interactive real-time experiential training. Augmented reality has found a home in businesses across various verticals for its ability to guide workers in complex processes and enable remote collaboration between colleagues. While AR can help businesses save time and money, particularly in terms of travel costs for subject matter experts, the problem is amplified, and more critical, for healthcare, where qualified experts are in short supply. According to the Lancet Commission on Global Surgery, approximately five billion people worldwide, or 70% of the world's population, do not have access to safe and affordable surgical care. The problem persists even in the developed world. A study commissioned by the Association of American Medical Colleges revealed that the US could face a shortage of more than 100,000 physicians by 2030, as the current pace of new doctors and specialists is trailing the rate of retiring physicians and the aging population. 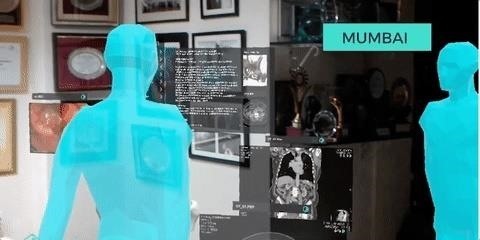 Luckily, in addition to Proximie's solution, medical professionals are already applying augmented reality to surgery via HoloLens not only to collaborate remotely on live surgeries, but also to assist in visualizing the complexities of the human anatomy during procedures. Surgeons could also opt for remote AR telepresence platforms from the likes of RE'FLEKT and Scope AR that provide similar see-what-I-see functionality running on smartglasses from DAQRI, ODG, Google, or Vuzix, among others. "Through simple, everyday devices that we take for granted, we can really do miraculous things," said Hachach-Haram. The full TED Talk is embedded below, with even more gruesome surgery footage. Enjoy! News: Tale of the Tape — How Does Apple's Measure App Measure Up Against Google's Version?